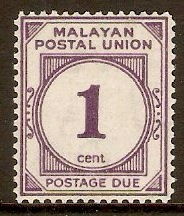 Malayan Postal Union 1951 1c Violet Postage Due. SGD14. Mounted mint 1951 1c Violet Postage Due. SGD14. 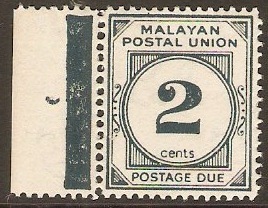 Malayan Postal Union 1951 2c Deep slate-blue Postage Due. SGD15. Unmounted mint 1951 2c Deep slate-blue Postage Due. SGD15. With sheet margin. 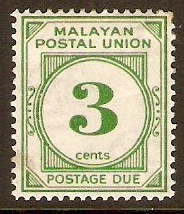 Malayan Postal Union 1951 3c Deep green Postage Due. SGD16. Mounted mint 1951 3c Deep green Postage Due. SGD16. 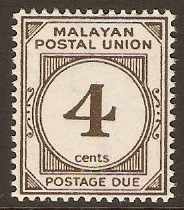 Malayan Postal Union 1951 4c Sepia Postage Due. SGD17. Unmounted mint 1951 4c Sepia Postage Due. SGD17. 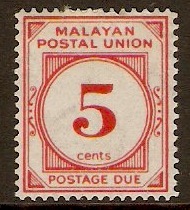 Malayan Postal Union 1951 5c Vermilion Postage Due. SGD18. Mounted mint 1951 5c Vermilion Postage Due. SGD18. 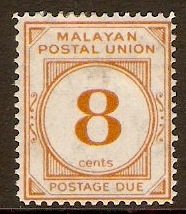 Malayan Postal Union 1951 8c Yellow-orange Postage Due. SGD19. Mounted mint 1951 8c Yellow-orange Postage Due. SGD19. 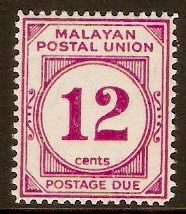 Malayan Postal Union 1951 12c Bright purple Postage Due. SGD20. Unmounted mint 1951 12c Bright purple Postage Due. SGD20. 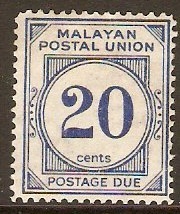 Malayan Postal Union 1951 20c Blue Postage Due. SGD21. Heavy mounted mint 1951 20c Blue Postage Due. SGD21. 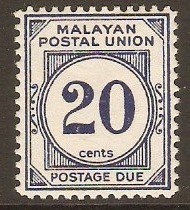 Malayan Postal Union 1951 20c Deep blue Postage Due. SGD21a. Mounted mint 1951 20c Deep blue Postage Due. SGD21a. Perf 12½. 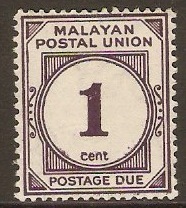 Malayan Postal Union 1936 1c Slate-purple Postage Due. SGD1. Mounted mint 1936 1c Slate-purple Postage Due. SGD1.